Obviously, anyone who knows about the history of the Netherlands and of Amsterdam simply can’t ignore our maritime roots. 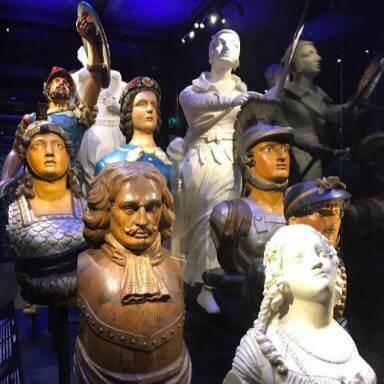 For centuries, the Dutch have been at the centre of the shipping world and has chosen to proudly show off its past at the Scheepvaartmuseum (or Maritime museum) in Amsterdam. It’s high time I paid a visit! The monumental building in which the Scheepvaartmuseum is located was built in 1656 and originally served as a warehouse. At that time, Amsterdam was the largest port in the world! The Zeemagazijn or Sea Warehouse, as locals call the building, was renovated years ago with the aim to preserve its history. In 1973, the Scheepvaartmuseum was established inside this perfectly chosen location! With some 400,000 objects in the museum collection, we were kept happy for a long time. Beautiful paintings, utensils, models of the different types of boats, and much, much more are on show. What I found most exquisite was the old greetings card collection. Some are hand-coloured, something done at the factory today. The medal collection is also very interesting. View the treasures in person by buying your ticket here! In addition to objects from centuries past, more recent items are also on show. For example, the Scheepvaartmuseum has a life jacket from the Costa Concordia in its possession. The girls liked the toys made in the form of a whale; children played with this toy between 1940 and 1970. The Scheepvaartmuseum offers at least 2.5 hours’ entertainment. We didn’t get bored for a second. All of the collection is well worth seeing. Many areas have things to see, and are often interactive. This is a modern museum. The building alone is worth inspection; it has a beautiful courtyard with a glass roof. The entrance fee also includes a visit to the replica of the Dutch East Indies Company ship, De Amsterdam. A visit to the Scheepvaartmuseum is highly recommended! Want to save time and money? Then buy your tickets here in advance. You will not have to stand in line and will also pay less than on the door. It’s impossible to get bored with such a diverse selection of objects! The museum consists of 3 wings: north, east and west. You can discover different collections in each wing. They haven’t forgotten the children, either! Would you like to learn about life on board? Then go to the west wing. A life-sized board game teaches you everything about life on board in a playful way; who had what role, what they did on the ship, and even what they ate. You might think that only the children would appreciate this, but my sister and I also had a great time playing. It is a great alternative to walking quietly through a museum and merely using one’s eyes. If you answer the game questions correctly, you receive the rank of captain and a diploma. For kids up to 6 years old, something special is on offer. They watch a movie about a ship while the rest of the family plays the board game. The Scheepvaartmuseum really is a great destination for the entire family. The museum offers a free audio tour, available in 11 languages. This tour takes you through two of the three wings in an hour’s time. I do not recommend it for children or for those who prefer to discover everything at their own pace and aren’t too bothered about the details. However, for more curious adults and older children an audio tour is definitely worth considering. Those who have visited Amsterdam have probably seen the replica of De Amsterdam from afar. On its maiden voyage in 1749, this VOC ship crashed and sank during a severe storm. In 1985, the construction of an exact replica of this famous ship, which has been docked at the Scheepvaartmuseum since 1991, began. 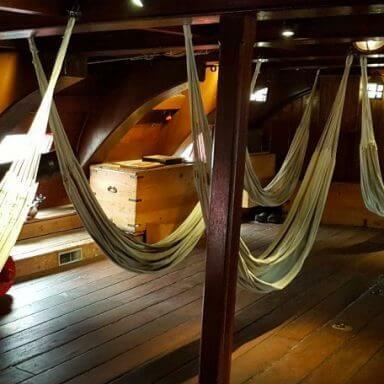 You can visit the VOC ship during your visit to the Scheepvaartmuseum and find out about life on board. Walk the decks and admire this stunning replica. The children will love it, too. 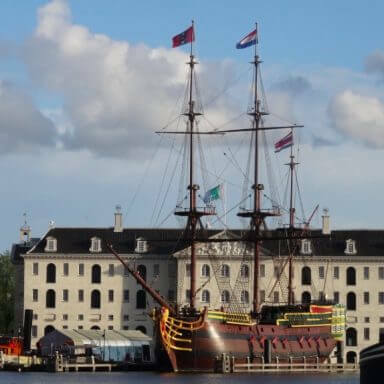 The Maritime Museum is located at: Kattenburgerplein 1, 1018 KK Amsterdam. There are a few parking spaces nearby where you can park with special rates. Buses 22 and 48 (both leave from Centraal Station) will take you to the museum. Get off at the Kadijksplein stop. You can also take the 20 minute walk to the museum from Centraal Station. Either go on foot via the Oosterdokskade past the public library and NEMO, or via the Prins Hendrikkade. 647 visitors rated The National Maritime Museum average 4.55 stars out of 5.